I bought this game from eBay; the only pinball machine I ever bought from there. It was listed as a 1963 Bally Monte Carlo. This was not a correct listing, and there was only a single fuzzy long-distance photo of the game. 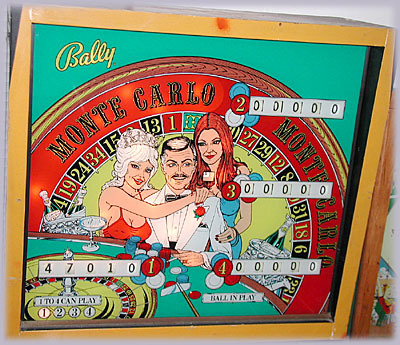 Bally *did* make a game called Monte Carlo in 1964, but this isn't it. I could tell by the cabinet color in the pictures that this was really the '73 version, but the seller had no idea which game he had. The '64 game was a real dog (in terms of gameplay), and the mistaken eBay ad might have disuaded some pontential buyers who might not have looked closely at the photo. So I bid a relatively low amount, and ended up winning the auction (sight unseen), for $392. I brought the game home on September 29, 2003. I sold this game on July 12, 2004 to Dangerous Dann Frank. The backglass and cabinet are in very good shape. The only knock on this particular unit is that someone put a number of red spots of spray paint scattered throughout the cabinet. I think it was intended to cover up some minor nicks in the cabinet, then scattered throughout in order to give it an even look. I haven't yet tried to remove the paint with chemicals, but I may try it in the future. The insides of the game are very clean, and I didn't really have to do much to get it working fully, aside from cleaning some contacts and replacing a lot of burned-out bulbs. 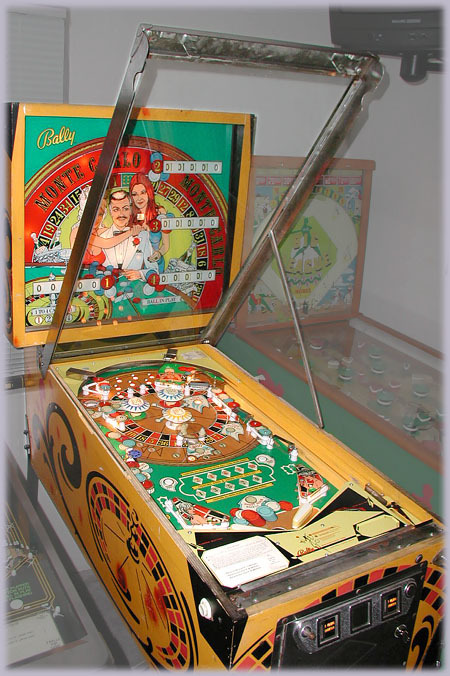 This is the Monte Carlo playfield. 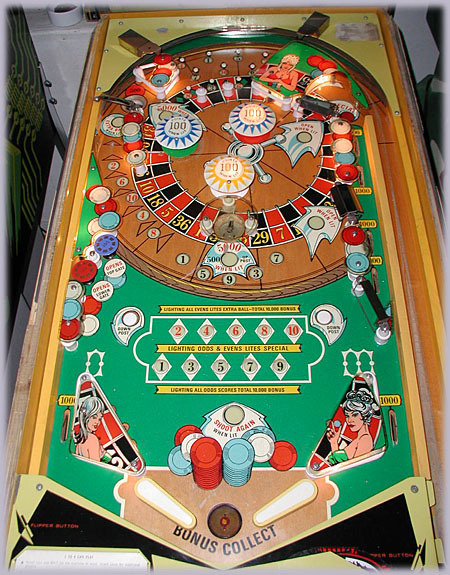 The game is the four-player version of the game "Odds and Evens", produced by Bally simultaneously starting in March 1973. As I mentioned above, I bought this game sight unseen-- I only had seen the poor eBay picture of the game from a distance which enabled me to identify the game, but not tell anything about the condition. The playfield has some flaws, but in fair condition for the price. There are a couple o fwear spots down to wood, and one fairly large scratch through the playfield paint in the vicinity of the center' odds' hole. But all in all, it's a very presentable game. The object of the game is to light as many of the 10 numbers as you can. There are two ways to light the numbers. The first is by rolling over the mini-rollover bouttons at the top of the playfield. This is mostly done at the beginning of each ball in play, so it is kind of a plunger skill shot. The upper area can be re-entered by a fortnate bounce off of the upper right pop bumper, but the area is generally well-protected by a couple of closely-spaced posts. 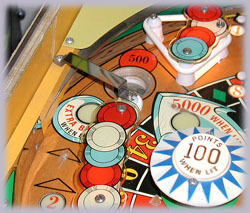 The other way to light numbers is by shooting the ball into one of the saucers on the playfield. One lights selected odd numbers and the other light evens. 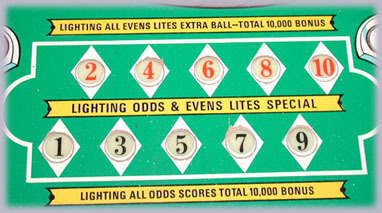 The number selected for each hole cycles through the five available numbers by hitting other switches on the game, such as slingshots and pop bumpers. The odds hole will also raise a center post between the flippers that will prevent the ball from draining. The post stays up until one of the 'Down Post' rollover buttons is triggered. 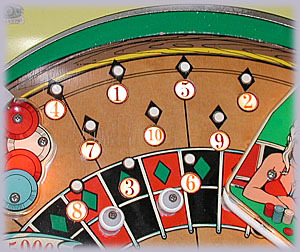 In the center of the playfield is the numbers "scoreboard" that keeps track of which numbers are lit. As you can see on the playfield, lighting all evens lights the Extra Ball which is collected by putting the ball in the Evens saucer one more time. 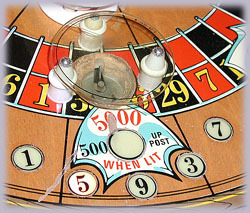 When either set of numbers is all lit, the value of the respective saucers goes from 500 to 5000, which is a significant difference for this game. Lighting all ten numbers also will light the Special, collected by hitting the ball through the upper gate on the right side. Also, for each set of numbers lit, the player earns an extra 5000 points during the end-of-ball bonus countdown. This game also made early use of the Mushroom Bumper. These are scoring switches that are triggered by the ball hitting and slightly raising the top of the 'mushroom'. They do not kick the ball or otherwise add any momentum, but trigger a switch only. 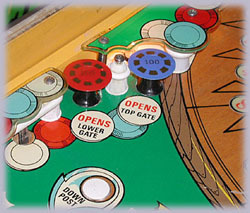 In this case, each mushroom bumper will open the respective gate on the right side of the playfield through which the player can potentially score big points. If the gates are already open, the bumpers score 100 points only.